KUALA LUMPUR - The Philippine Olympic Committee (POC) appealed for support to the athletes in the wake of the country's worst medal finish in 18 years in the Southeast Asian Games. In a statement on Wednesday, the under-fire Cojuangco said now is the time to support the athletes especially with the Philippines set to host the next edition of the biennial Games in 2019. "All of us, including the critics, should rally behind the 2019 Philippine hosting and support our athletes in any way we can," said the long-staying head of the country's top Olympic body. Cojuangco didn't bother to comment on the Philippines' performance in these Games, where the 24-gold harvest was the country's lowest since the scaled-down 1999 edition in Brunei. 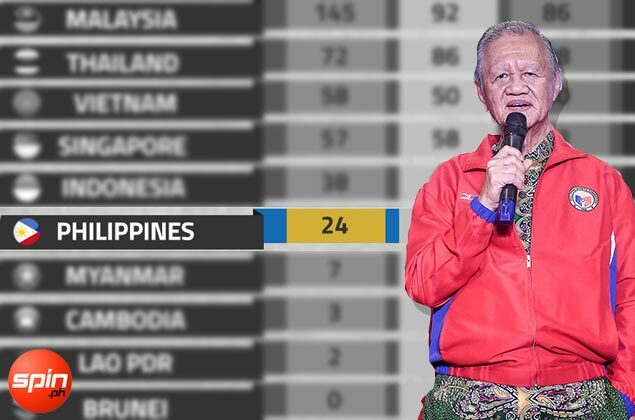 With a 24-33-64 gold-silver-bronze tally, the Philippines remained mired in sixth place in the standings. What the controversial sports official bothered to defend was the POC decision to choose a simple turnover ceremony over an P8-milion production during the closing rites late Wednesday. "It will not take five minutes for the turnover because the program prepared by Malaysia is highlighted by the celebration of the Independence Day of the host country and as overall champion of the Games," said Cojuangco. Cojuangco said they ditched the plan to perform a 20-minute presentation as the Malaysia SEA Games Organizing Committee (Masoc) has already laid down the closing program before the request was made. "How could we insist with the host country and the Masoc to present a 20-minute presentation when the closing program has been finalized long before the Games started and coincided with the Independence Day of Malaysia," said Cojuangco. Cojuangco also blasted chief de mission Cynthia Carrion as she was unable to present to the POC board the program for the closing ceremony. "And the CDM, who attended the CDM meetings before and during the Games, could not even show the POC board a program that included a Philippine cultural show," said Cojuangco. Nevertheless, Cojuangco said the memorandum of agreement between the POC and the Department of Tourism and the P8 million check for the supposed cultural show in the closing ceremony was brought here by the POC's finance officer during the SEA Games.